OK, It’s time to buy more oil paints and you walk into your local art supplies store. (Hopefully NOT a Big Box Crafts warehouse) All those shiny tubes of vibrant colors are calling to you. So which green should I buy? Will it be Sap Green, Permanent Green, Viridian and the list goes on. Buying oil paints is like buying shoes, you can spend a fortune, have too many choices and a storage problem. 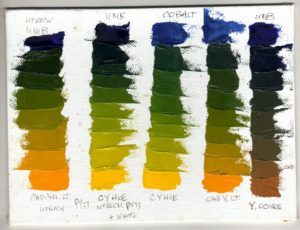 Here is a photo of my basic oil painting painting palette of colors and their layout. 3 primaries plus White and a few “convenience colors”. Remember the KISS method, Keep It Simple Students! 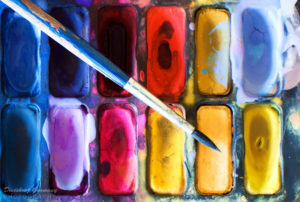 Stick with three primary colors plus white and you can save yourself lots of color mixing headaches. Focus on quality paints, rather than price. Save you money to buy quality brushes. SHOPPING ALERT: If you see large tubes of paint, all the same price, you are buying “student grade” paints filled with lots of fillers, and very little pigment. Disclaimer: I recommend buying Utrecht Oil Paints if available, as they are the best quality for the best price. All my teachers at the Academy of Art University in San Francisco use these paints personally and recommend them highly. None of us are getting paid a dime to endorse their great product. If your local store does not offer these paints, I recommend buying them online at: http://www.utrechtart.com/. 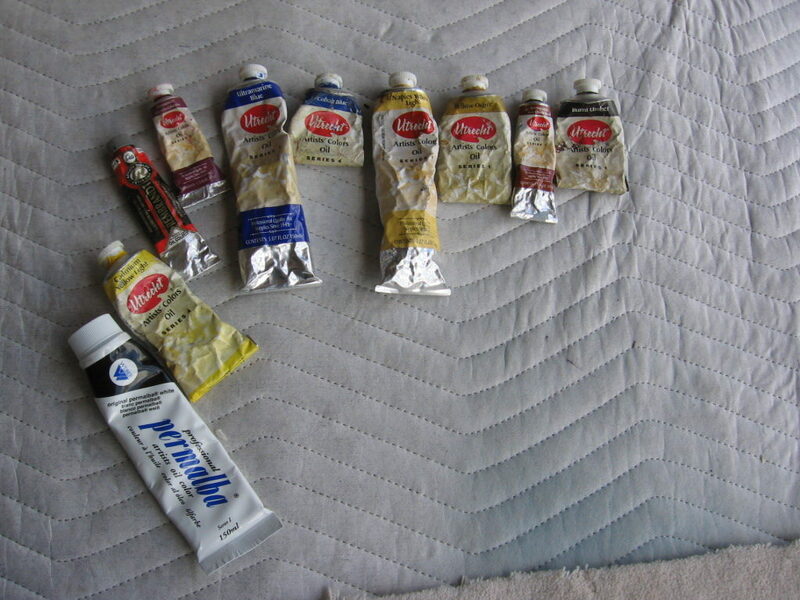 My second choice would be Gamblin Artist Oils and their Gamsol Odorless Paint thinner. 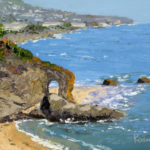 Michael Rodman – Oil Painter – Art Instructor in San Francisco area. This motto should be tattooed to every artist’s arm, so they don’t forget. Or at least written on a piece of masking tape and placed on your painting palette/easel as a reminder. Beginning artists tend to drive themselves crazy and spend way too much time “mixing the perfect color”. Rather they should be thinking more about the correct “value”, the lightness or darkness of a color. A traditional value scale ranges from 100% white to 100% black, with all the shades of grey in between. Things in the distance are lighter and bluer. In previous postings I mentioned, things in a landscape painting vary in value, based on where they are positioned on the painting. Distant trees/hills are always lighter, bluer and slightly more grey than objects in the foreground. Next time you drive along Hwy. 280 or your local Interstate, look at how distant trees get lighter the further away they are from you. That’s how they must be painted, lighter and lighter the further away they are..
Save your darkest shadows for the foreground. Every vertical object outside casts a shadow, assuming the sun is out. Painting shadows can be tricky because the same rules apply to shadows as I mentioned above. Your eyes and mind tell you that all shadows are dark, so you end up painting them too dark everywhere. Imagine trees on a distant hillside. If you look carefully, they are casting shadows on the ground nearby. When it comes time to painting them, lighten them up with a touch of white or Naples Yellow Light to make them more soft and muted. It’s not about the color, it’s about the value. Look at my painting above. I painted it in honor of a group of local California outdoor painters called, The Society of Six. In this painting I tried to break all the traditional color rules by using only the 3 primary colors. So a normal blue sky was painted a bright yellow, distant green hills were painted red, and the green tree foliage was painted dark blue. The painting still “reads as a painting” without using traditional landscape colors because the values of the 3 primaries still represent, light, medium and dark areas of the painting. I challenge you to paint a landscape painting using only 3 primaries plus white and no mixing of the secondary colors allowed. You will be amazed at your final results. Mix the objects “middle value” first. Trying to mix the perfect color takes way too much valuable painting time. Better to mix the “local color” or “average color” of an object and then lighten and darken the mixture as needed. Save your highest contrast values for your focal point/area. As I mentioned in Blog #2, photos show everything in high contrast. As a painter, you want the viewer to focus on what’s important to you in the painting. Said another way, painting your “darkest dark” next to your “lightest light” forces the viewer’s attention to look at your painting’s focal point/area. Everything outside your focal area should be painted less bright, more muted in color and without crisp edges. FYI, our next blog is entitled, “Yikes, so many greens to mix”. Beginners always struggle with mixing the “perfect green”, as there are so many green objects in nature. 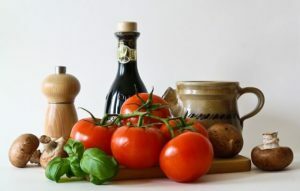 I’ll be presenting an easy step by step process to mix all your greens from freshly cut grass to olive green oak trees. Please feel free forward and share this info with fellow painters. Painting from Photos, friend or foe? “Painting from Photos, Friend or Foe”? 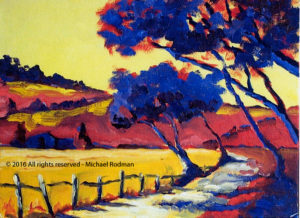 Painting Tips & Tricks by Michael Rodman. Take your own photographs! There is nothing like being outside taking photographs of your favorite subject matter. You remember the weather, the sounds, the smells and how great it feels to be out in nature. Forget painting from Internet photos. Most photographs on the internet are tweaked in Photoshop or some other photo editing program and have insane color combinations. The color saturation has been overly adjusted so everything looks like it’s made of plastic with neon electric colors that don’t exist in nature. Your paintings should represent nature to the viewer, not make them run for their sunglasses. Copying other artist paintings is a bad decision. Here’s a few questions you might ask yourself before you think of copying another artist work on the Internet. First, is the painting painted by an experienced artist and is it any good? Anyone can upload an image of a painting onto the internet. About 90% of all the ones my artists bring to me have painting errors. Things like bad drawing and perspective, inconsistent lights and shadows and poor color or value decisions. Most always have poor compositions. Bottom line is the phrase, GIGO, garbage in, garbage out. Why invest your time and painting supplies replicating a poorly painted painting you saw on the internet? Use it for inspiration maybe, but make it your own creation! Photos make everything in HIGH CONTRAST! Your camera’s main function is to make everything it captures thru its lens, razor sharp. Basically it makes the lights, lighter and the darks, way too dark. Not just in the foreground, but all those trees way back in the distance. It increases the contrast on everything. When I see a painting where everything in the painting is painted in fine detail, including off in the distance, I know it was painted from a photo. Basically a beginner mistake. If you were outside looking at that same image, you would see the distant objects are lighter, softer and bluer. Experienced painters know NOT to trust the photo 100%. Use it for reference, but “paint what you know”. Use your camera for composition first, and color second. I take tons of photos outdoors that later become great paintings. The camera helps you focus on just what fits into the viewfinder. Said another way, it helps you crop your paintings composition. Many folks take gigabytes of digital photos only to run out of storage space on your SD card. I prefer to set my camera settings at the old VGA setting of 640×480. I just want the overall composition without 12MB of useless color detail. I use the camera to “crop as you go” to avoid endless hours in Photoshop. If you find a great subject, crop it vertically and horizontally, and zoom in for the real winning composition. If you find these Painting Tips & Tricks helpful, please share these with a friend and ask them to join my mailing list.